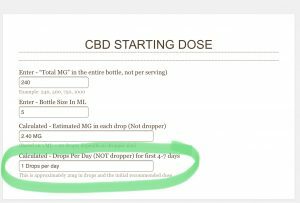 CBD Dosage Calculator 2019 ⋆ ADHD-Naturally! Super Easy! Looking for CBD for ADHD? Finding the CBD dosage for ADHD, it is important to start low and slowly increase. Our CBD Dosage Calculator or CBD Calculator provides starting CBD dosage for anyone who wants to begin using CBD. The CBD calculator can determine the starting CBD dosage for an ADHD child, CBD dosage for ADHD adult, CBD dosage for Autism, or for anyone who has never used CBD and wants to start. 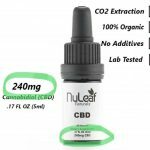 CBD Calculator – Why Do I Need It? Due to the nature of the industry, lack of regulations and inconsistent labeling, it is difficult for a consumer to determine the strength of any product based on the milligrams on the front of the bottle. Those milligrams, whether they be 250, 500, or 2000 reflect the TOTAL milligrams in the entire bottle. 2000 milligrams infused to a gallon of MCT oil, is not stronger or more potent than 500 milligrams infused to 5 ml of oil even though the total milligrams is more. In order to determine the strength or potency of a product, it must be converted to milligrams per milliliter (mg/ml). CBD oil products are typically sold in 15-30ml bottles (samples size bottles can be as small as a 5ml bottle). Each full dropper of CBD oil holds approximately one ml of liquid, which on average is about 20-30 drops, depending on the dropper size. To determine the milligrams in a single dropper (mg/ml), divide the total amount of CBD in the bottle by the number of milliliters of oil in the bottle. Notice the 250mg in 5ml (above) is more potent than the 500mg in either 30ml or 15ml, in this example. because it is more concentrated. However, when the 500mg is added or infused into 5ml (same size bottle or liquid quantity) it is more concentrated or more potent. Milligrams and millimeter are both important when calculating the concentration or strength of a CBD oil product. Milligrams (mg) are only half the story. Many leading CBD experts suggest starting low but never suggest what “low” is. We suggest everyone, no matter weight or age, start at 2 mg, so that you don't skip your beneficial dose. Typically 2mg is equivalent to one single drop (like a single rain drop). For less concentrated products, you will need more than a single drop to equal 2 mg. It is so important to know the milligrams you are taking, not just drops, in the event you need to transition to a new product that is concentrated at a different amount. The Calculator below, does all the math for you and determines the milligrams (mg) per drop, and then our CBD calculator determines the number of drops that equal 2 milligrams (mg). No worries if you aren't proficient in math. We made it easy! Each person’s Endocannabinoid System is unique, therefore age and weight have no influence on the most beneficial dose. That is why experts agree that the low and slow method is best. Based on user data, adults (looking to reduce ADHD and co-morbid symptoms like anxiety) on average find a dose of less than 20 mg most beneficial, while children may need a much higher dose . This is why we suggest starting low for everyone, so that the beneficial dose is not missed when starting too high based on an age/weight chart. Also, beneficial dose also depends on severity of symptoms, which again makes age/weight irrelevant. We recommend everyone starts at 2mg per day for a sublingual dose, and 4-5 mg per day if ingesting CBD (gummies or adding to any food or drink), however you can always start lower. You can increase the milligrams (mg) whenever you feel comfortable doing so but look for these side effects from taking too much, too quick. If you experience these, back off the amount the next day. Step 1 – Enter the amount of total milligrams (mg) on the bottle. Typically, it will be 240, 500, 725, 900, 1000, or 1500. This is the total amount of cannabinoid extract in the bottle. Step 2 – Enter the amount of fluid in milliliters (ml). Step 3 – The number of drops calculated, reflect approximately 2mg. This dose is a per day dose. The number of drops (If more than 1), can be split into micro doses and be given in the morning and evening, morning-mid day-evening, all in one dose, or any combination you choose. It depends on which is most convenient and effective. Stay at 2 mg for at least 4 days before increasing. Still shopping for the perfect product that works best for you? Check out our list recommended brands. Are you considering Gummies? We have done all the research to find All Natural Gummies with no artificial ingredients. For the most accurate information on CBD for ADHD, join #CBD4ADHD on Facebook and discuss with others finding success with CBD.